We have two leash designs: one works with the Padded Harness Vest and the other works with the Working Dog Vest The distance between the 3 rings on the vests correspond with the 3 swivel scissor snaps on each of the leashes. 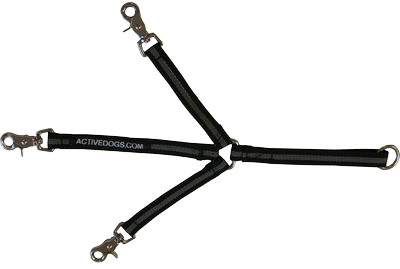 When using the vests for pulling, this leash distributes the weight so the dog can pull evenly. The leash gives you more control of your dog. The looped strap, on the back of the leash, is a handle with an attached O-ring. This allows you to attach another leash to give you a longer leash.